In their first tournament since the World Cup, the Indian men will hopefully get to ease their way towards the Olympic qualifiers, as the 28th edition of the Sultan Azlan Shah Cup gets underway in Ipoh from March 23. Surprisingly, no European team will feature in this year's competition, and neither will defending champions Australia, which paves the way for India to begin as the overwhelming favorites. Apart from India, the teams who have confirmed their participation in Asia's premier invitational tournament are Canada, South Africa, South Korea, Asian Games gold-medalists Japan, and hosts Malaysia. Experts reckon that the Pro League calendar is possibly the principal reason why most top-ranked teams have opted not to be a part of the forthcoming edition of one of the oldest invitational hockey tournaments in the world. FIH master-coach Siegfried Aikman explained to Sportskeeda that given the current schedule, sides like Australia and New Zealand do not have much of a choice, while for European teams, it was never easy to play such tournaments even before the Pro League was formed. "It is all because of the Pro League. The Pro League is eating up all the tournaments. From January until June, it’s Pro League time, and in western countries, they allow players a 1-month holiday in July. "From August, they start preparing for the leagues which will then be from September until May or June. Little option left for them to join other tournaments. "By the way, for most European teams, March and April were always difficult. When it was around Easter, some teams could opt for other tournaments, but that also became hard because that particular period was used for the Euro Hockey League matches. Australia and New Zealand were always available, but now they are not, due to the Pro League." As per the latest FIH rankings, the Canadian men are ranked tenth, five places behind India, while Ireland and Malaysia are ranked eleventh and thirteenth respectively. South Africa is ranked sixteenth, one slot ahead of two-time champions South Korea while Japan is now ranked eighteenth. Apart from the Aussies, the two other teams which finished on the podium in Ipoh 2018 -- England and Argentina, will also not be part of the action this time around. The Indians had finished fifth last year ahead of Ireland who had to settle for the wooden spoon. Quite a few eyebrows had been raised when Sjoerd Marijne's Indians had fielded a fledgling team for the Azlan Shah Cup last year, but the rookies performed admirably against the full-strength squads of the eventual medal winners. Sardar Singh, Ramandeep Singh, and SK Uthappa were the only senior members of the squad while Mandeep Mor, Sumit Kumar, and Shilanand Lakra made their international debut alongside a host of inexperienced players who gave a good account of themselves. Sreejesh, who had sustained a knee injury in the 2017 edition of the Azlan Shah Cup, was rested last year, and Krishan Pathak and Suraj Karkera, who had big shoes to fill, stood bravely between the posts pulling off some great saves. Scheduled, as it is, at the beginning of the year, the Azlan Shah Cup can be just the right platform to build a new team, as Siegfried Aikman explains. "Teams love to play the Azlan Shah Cup because of the high level of competition, and the very well-organized tournament. It is perfect to prepare a team for important tournaments or to build a new team." Building a new team, or one for the future, was indeed the idea of the Indian coaching staff prior to the Azlan Shah Cup last year, and the boys did not disappoint either but they failed to earn a podium finish. After a creditable draw against England, and hard-fought losses to Australia and Argentina, the Indians failed to get past the Irish in a pool encounter which put them out of contention for the medal matches. On the subject of medals, the Australians have been the most successful team in the history of the tournament that began in 1983, winning the title ten times. The kookaburras have made it to the podium every single time that they have taken part in the competition, also winning four silver and three bronze medals out of a total of seventeen appearances. Easy lung opener to begin the season - adequate for the Olympic qualifiers? The Indians have been part of the Malaysian invitational twenty-one times, winning four gold, two silver, and seven bronze medals, and will be looking to add another title to their tally given the fact that they are the highest-ranked side -- and also owing to their recent record against most other teams in the fray. 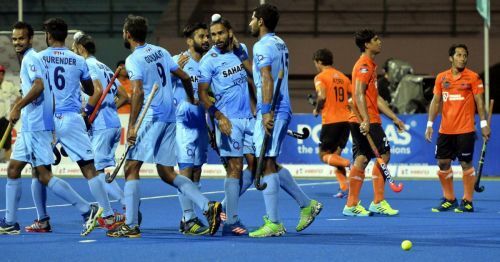 India beat Japan and South Korea at the Asian Games and Asian Champions Trophy last year and also got past Canada and South Africa in the pool matches of the Odisha World Cup, but hosts Malaysia may be a tough nut to crack. A young Indian side beat the hosts at the Azlan Shah Cup last year but lost to Malaysia in the semifinals of the Asian Games and recorded an insipid goalless draw against Roelant Oltmans' side at the Asian Champions Trophy at Muscat. The Indians will be keen to set the record straight against Malaysia ahead of the Olympic qualifiers which follow in June. Although the initial stages of the FIH Series Finals are not likely to test the Indians beyond a point, the latter stages of the qualifiers will also involve teams from the Pro League. How can the Indians prepare for the crucial stage of the qualifiers without an adequate amount of match practice against the best sides, considering that India is not part of the Pro League? Do, what the Japanese sides recently did, said Aikman, who recently traveled to Chile. "Play practice matches against Pro League teams during their home matches." "What the Indians can do, is travel to the countries who play their home matches from the Pro League, and play practice matches against those teams. That is what the Japanese women’s team is doing. They practiced against New Zealand, Australia and Holland, who are all very well prepared and therefore they played good matches. "We (the Japanese men's team) went to Chile to play against the Argentinians who were involved in the final preparations for their first Pro League match and we played against them with their strongest possible team." As far as the Indians are concerned, whether or not a relatively easy start to the year helps the boys, remains to be seen but a podium finish seems likely -- which would no doubt ensure a smooth start to whoever is given the unenviable task of coaching the Indian men in the crucial Olympic qualification year. Finally, the onus will be on the team management to try and organize preparatory matches against the top sides to ensure that the Indians are honed and ready before the final battle to make it to Tokyo. The core group for the senior men, meanwhile, is likely to be announced in the second week of February.